Oliver Trutina, vice-president with Truman, said the 15-year build cycle for West District includes 2,758 homes. About 2,000 of the residences will be multi-family properties, the rest single-family homes and townhomes. “There’s about 1.295 million square feet of office space which will be brought on, obviously, when things turn around but in the later phases. And we have about 382,000 square feet of retail,” said Trutina. Gateway, the only residential project currently under construction, is expected to be completed by the end of 2019. There will be about 30,000 square feet of retail on the main floor. 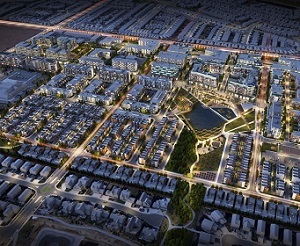 The Gateway project carries onto the Main Street concept of West District. This means the retail space will be located at street level with residential above, and all positioned along routes leading to Central Park. Behind Central Park will be more homes. West District, in the southwest quadrant of the city, is located within the communities of West Springs and Cougar Ridge. It is land located south of Old Banff Coach Road S.W., east of 85th Street SW, west of 77 Street S.. and north of 9th Avenue S.W. Trutina said Central Park will be an eight-acre crown jewel in West District. The idea is to create a recreational destination through park amenities such as perimeter walkways, a wetland boardwalk, amphitheatre, splashpad and playground, seasonal skating rink and an adult-oriented recreation area that features a skatepark, sports court and bouldering wall. Central Park construction will begin this year with expected completion by the end of 2019. Trutina said the office component of the project will most likely be constructed mid-stream of the entire development and will be a campus-style area of space. “For retail, the minimum would be about 250,000 square feet and the top will be around 380,000 square feet. It just comes down to what product we’re building at that time and what the market is looking for,” he said. “We’re trying to do a curated approach in terms of our retail. We don’t want to just slam in anything and everything.